This assortment pack is a collection of natural sound ear plugs specifically chosen for school age kids from middle school through high school who will participate in school or extra curricular band practice and performance. All of these ear plugs are designed to fit small to average sized ear canals. We included the Howard Leight Clarity natural sound ear plugs. These are a 4-flange reusable ear plug with an adjustable neck cord to help your young ones keep from losing their ear plugs. Also included are our Got Ears? brand MusicMinders Ultra, which are a smooth foam ear plug with a noise filter for clear, unmuffled sound quality. These are medium sized ear plugs with 20dB sound attenuation. MusicMinders are perfect for school or private bands. 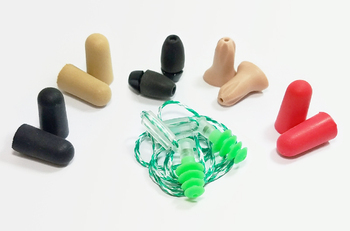 All of the included ear plugs are available for sale separately, so you can buy just your favorites, once you decide which you like. We offer quantity discounts on this pack so that schools can buy at lower prices, making it easier for the school to provide these to their music students. The discounted prices also make this assortment pack a natural fund-raiser item for band boosters and other parent support groups. These ear plugs have been chosen partially because they are inexpensive models to start with, and a great way to begin protecting against noise-induced hearing loss. As you can see, we carry many different musicians ear plugs, all of which are much more expensive than are these introductory models. Hearing protection should become a lifelong habit, and this assortment pack is a fun (and inexpensive) way to start teaching your kids about using ear plugs to protect their hearing from the dangers of loud sounds...including their own music! We hope you enjoy the experience as well. In schools all across the United States, our kids are suffering hearing damage at unprecedented rates. Voices throughout the healthcare and music industries, from teachers and parents to professional musicians themselves, are delivering alarming news about the dangers to which constant music listening is exposing our kids today. We have an epidemic of NIHL (noise-induced hearing loss) that is sweeping the nation. Please, take care of your kids' hearing. Once damaged, it cannot be repaired. Help your children protect their hearing so they can continue to enjoy music throughout their lives. Encourage the music teachers and administrators at your local school to enforce hearing protection use by all the kids in all music practice and classes. Our government, through OSHA, forces the use of hearing protection for adult workers who are exposed to dangerous noise levels in the workplace. We believe it is time we all demanded that schools protect the hearing of our kids during all school activities that produce dangerous sound levels. Please speak up and let your school know you are concerned about noise induced hearing damage in your children. If your child complains of ringing or hissing in her ears after band practice or performance, she is being overexposed to volume that is dangerous and can result in permanent hearing damage. You should take immediate action. Keep your child out of the music room until you can get adequate hearing protection for her. If her tinnitus persists beyond a day, you should have her examined by an audiologist. If your child seems to need the volume to be turned up to a level you find much too loud, that can indicate he has already suffered hearing damage. Do not just assume he is "just being a kid." A hearing exam by your audiologist is in order, and you should immediately get him some kind of hearing protection he can use in noisy situations to help prevent further damage. Remember: hearing damage is permanent. Once the delicate inner ear parts have been broken, they cannot be repaired. If your club or organization would like to sell musicians ear plugs as a fund-raiser at your school, we would like to support you in that effort in any way we can. We will give you the best prices we can to encourage these programs. Please get in touch with us. We are here to help: , 918-478-5500.